How long has there been an education in reindeer-herding? Some claim that the first school of reindeer-herding was in Jiebmaluokta (Hjemmeluft) in Alta. Indeed, their blackboard has been preserved. They didn’t have chalk and sponge, so they wrote in stone. That’s why there are so many rock-carvings that depict reindeer and corrals/fences, as well as fishing and trapping. All this is still part of the curriculum at the Reindeer-herding school. Even though reindeer-herding has traditions that go way back into history, formal instruction in reindeer-herding is a relatively new phenomenon. 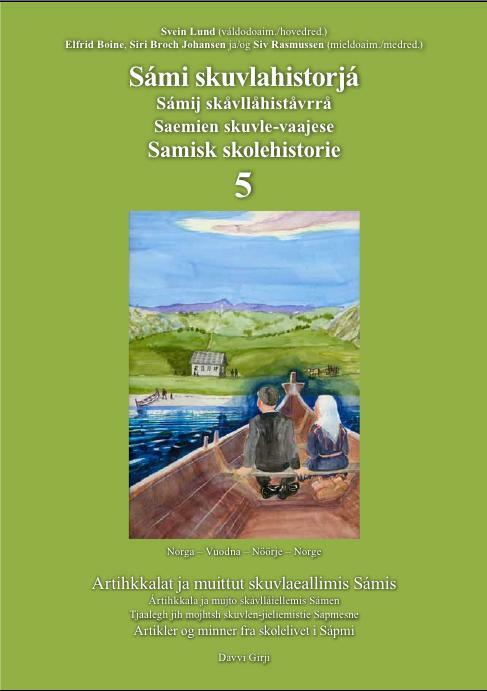 As we have shown in the previous article, in the old primary school, there was nothing about Sami culture or livelihoods. The first instruction/education in reindeer-herding in school, seems to have been at Karasjok Continuation School (framhaldsskole) in the 1950s. 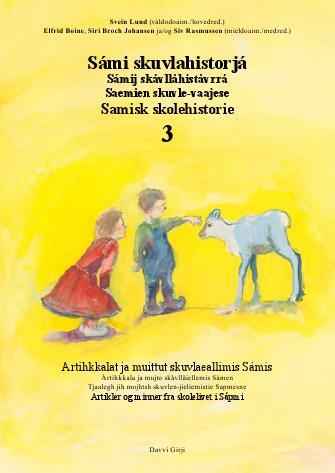 After that, it became a study-course in reindeer-herding at Karasjok Upper Primary School (ungdomsskole), ten years before the State Reindeer-herding school started up in Kvæfjord in 1968. This piece is an extract of the pamphlet “Joatkaskuvla – Framhaldsskolen” (Continuation School) that L. L. Meløy wrote in 1956. He was then leader of the Inner Finnmark School-Council and later became Director of Schools. 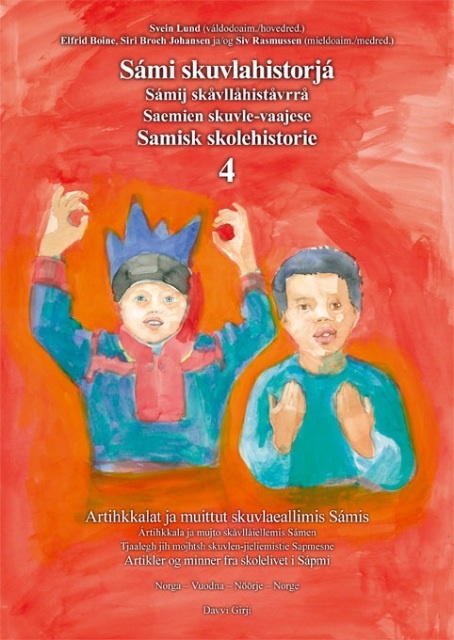 The pamphlet was published in both Sami and Norwegian. 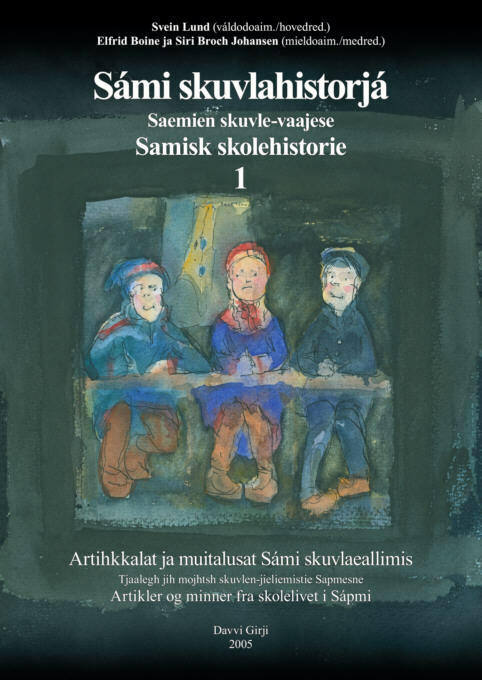 In the Nomadic-Sami school, we want to try and gather all the material from natural science, history and geography under the heading of a subject we have called nomadic-knowledge. Nomadic-knowledge will, however, contain far more than the sum of the three aforementioned subjects, since young nomadic Sami will, through this subject, acquire knowledge that will benefit their profession, as well as knowledge that provides an insight into nomadic Sami culture. This subject will include material from the Arctic region, or from those regions of the world where reindeer live. The emphasis will though, be on Finnmark. The pupils will get to know plants and animals from the Artic region, first and foremost among which will be the reindeer, which will be dealt with in some depth. This section on the reindeer will include reindeer-diseases and reindeer-pasture as well as the art of making the best use of the reindeer. The section on reindeer-pasture will include the study of the moss, lichen and the types of grass that are suitable as reindeer-fodder. Here it is appropriate to include something about the soil, bedrock, weather and climate. Furthermore, the pupils will be familiarized with the legislation that applies to reindeer-herding. In connection with an overview of the various grazing-districts, it is appropriate to deal with migration and migration-routes. Marking of reindeer and familiarity with ear-marks of the herds each individual pupil comes into contact with, is important. In addition, castration and simple rules for the slaughter of animals in the field are also dealt with. When talking about making maximum use of the reindeer, we have to include both the animal that is slaughtered for the individual family’s needs – where both meat, blood, skin, sinews and horn are kept and used, as well as the modern form of production that involves the delivery of animals to slaughterhouses. There is reason to discuss what potential lies in this form of production.. . In accordance with that which is here stated, nomadic-knowledge will be the core subject in the Nomadic-Sami Continuation School. The other subjects will all, to a greater or lesser degree, acquaint nomadic Sami pupils with their profession and the history of their people. There is, apart from this, good reason for including the aforementioned historical material in the other classes as well. Mountain course of the Reindeer-herding class 1959, near Ytre Billefjord in Porsanger. 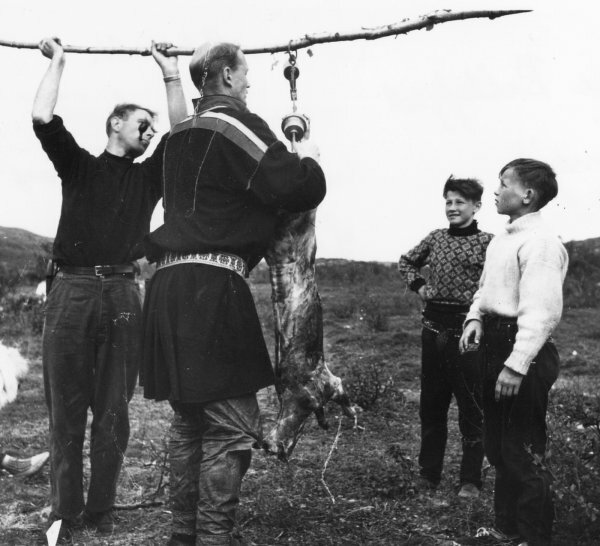 Teacher Bjørn Aarseth and veterinarian Sven Skjenneberg weighing a slaughtered reindeer calf. The pupils in the picture are Per Eira and Johannes Sara. 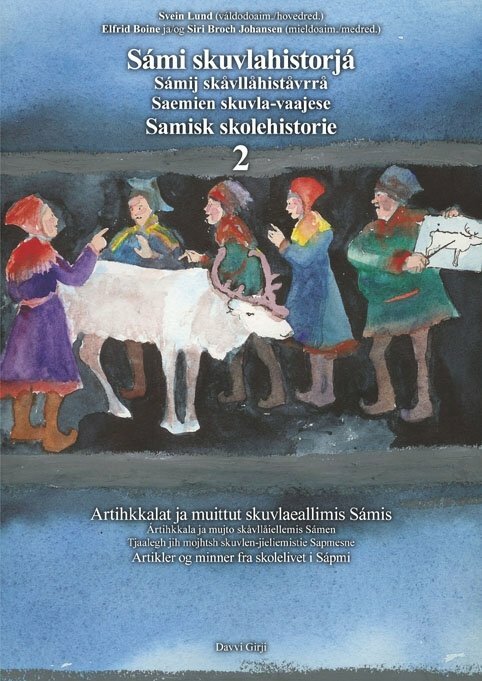 Bjørn Aarseth, the then head-master of Karasjok Upper Primary School wrote an article in the book Sámi Ællin (Sami life) in 1961/63 about the reindeer-herding study-course there, and this is an extract of that article. In 1958, Karasjok municipality started a policy of course-division at the Upper Primary School. With willing co-operation and support from the Trial Council for Schools (Forsøksrådet), and from the Ministry of Education and Church Affairs, permission was given to establish a specific reindeer-herding course for classes 7 – 9, - this is, so far, the only reindeer-herding course in the country. The General Practical Reindeer-Herding Course, Popularly known as the R-course, has the same subjects and curricula, with regard to general subjects, as the General Practical Course (Y-course), with the exception of English. This subject, which is voluntary on the Y-course, has, on the R-course, given its place on the timetable to Norwegian, social-studies and the new subject Nomadic knowledge, which is a direct translation of the Swedish “nomadkunnskap” (nomad knowledge). The time spent at school on the reindeer-herding course departs somewhat from the usual pattern. The pupils spend 27 weeks in the classroom (November-June). In addition, there is a 4 week outdoor course (field-study course) in July-August. Furthermore, the pupils are obliged to take part in practical reindeer-herding activities for at least 7 weeks every autumn (August – November). This work-placement can be with the pupils own parents, and in practice, it is invariably so that it is the parents or close relatives who are their teachers and masters during those busy autumn months, during which so much happens in reindeer-herding. A majority of the pupils work 10-12 weeks in reindeer-herding every year. Prior to the start of the work-period, the pupils are given a long list of tasks that are supposed to stimulate them to make observations which they then give a report on at school. It is especially important that they gather material and acquire a more or less common experience-base for further work in the classroom. It is also assumed that the pupils, during work-placement in the autumn, learn and receive training in working methods that cannot be integrated into the school-curriculum. The report-sheet will be a constant reminder to the pupils that it is an important apprenticeship and part of their education. It was no easy matter, building up an education in reindeer-herding from scratch. I had the great advantage of being familiar with just about the whole of Norwegian reindeer-herding through my work as a veterinarian and through NRL (Norwegian Association of Reindeer-herders). On the other hand, I had no teacher-training or teaching experience. We had very few text-books. With the exception of Sven Skjenneberg’s book “Rein og Reindrift” (Reindeer and Reindeer-herding), everything else had to be made on the day. We had to make up the subject-curricula as we went along. Apart from myself, only state consultant Loyd Villmo on the curriculum-committee had any form of reindeer-herding background. The rest were teachers with an agronomic background. In making up the curricula, we took our starting-point in the curricula for agricultural colleges, which we then attempted to adapt to reindeer-herding. But it was real pioneering work, nobody had done anything like that before, so we had nobody we could ask. (Photo: Loyd Villmo) Reindeer herding and gardening school at Borkenes, Kvæfjord. 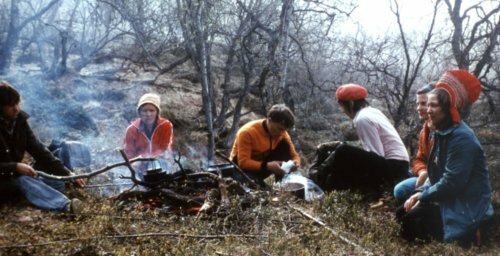 When the Reindeer-herding school was set up at the Gardening School in Kvæfjord in 1968, creating a proper school of reindeer-herding was by no means a simple affair. A fact confirmed by Inge Andersen, who was a pupil during the first school year and who, himself, later became a teacher at the Reindeer-herding school. - The teaching, was in many ways characterized by the fact that the Reindeer-herding school was located at a gardening school. We ended up learning a mixture of relevant and less relevant material. The curricula hadn’t been properly worked out in all the subjects when we started, and there weren’t a lot of text-books either. In many of the subjects, we had the gardening school’s regular teachers, and that was reflected in the teaching. In botany, we learnt mostly about cabbage and carrots, corn and fertilizer. But I do remember Loyd Villmo giving us a short course in the reindeer’s food-plants. When we learnt about buildings, it was about farm buildings in agriculture, which wasn’t particularly relevant for reindeer-herding. In technical subjects we had an old agricultural school teacher from down south, but we did some mechanical work on an old snowmobile, so at least that part was relevant. Economy was also mainly agricultural accounting, which was certainly quite different from what was required in reindeer-herding. Here as well, Loyd Villmo had to step in as a guest teacher, so that we could at least learn something about herding economy.